An abstract representation of the soccer-ball shaped buckminsterfullerene molecules in virtual reality. Credit: Mike O'Connor, in collaboration with Interactive Scientific Ltd, under CC BY-ND 4.0. A team of researchers affiliated with several institutions across the U.K. has developed a framework for using virtual reality (VR) systems to teach chemistry. In their paper published on the open access site Science Advances, the team describes the system they developed and the advantages it has over standard teaching methods. For many years, chemistry students have been taught to manipulate physical models depicting molecules as a means of learning how they work. The researchers note that such models are not up to the task of showing how molecules work dynamically—they cannot show movement or the flexibility of molecules, which leaves students having to imagine how they might look. In more recent years, computer applications that allow students to watch and even manipulate molecules onscreen have led to improvements in teaching techniques. But, as the researchers also note, such apps that generally make use of touch screens still lack the required hands-on approach. To improve on such applications, the researchers have created a VR system that is able to show complex molecules as they exist in a 3-D space. And even better, users are able to physically manipulate the molecules to learn more about their properties. With their new system, the researchers point out, users are able to achieve co-location, which they describe as a phenomenon in which interactions in an actual 3-D physical space align with interactions in a simulated 3-D environment. Their system is cloud-based, which means the data used in the simulations can be constantly updated and improved, even as the system is being used. Multiple users performing 3-D molecular tasks in the cloud-enabled virtual reality platform developed in collaboration between the University of Bristol and Interactive Scientific Ltd. Credit: Helen Deeks and Matt Sutton, in collaboration with Interactive Scientific Ltd, under CC BY-ND 4.0. The system currently allows six people to use the system at the same time—they can be in the same room, or other parts of the world. Users use wireless controllers that behave like tweezers, allowing them to grab molecules and their parts. To test their system, the researchers asked 32 volunteers to carry out three different tasks: manipulating a methane molecule through a carbon nanotube, manipulating an organic helicene molecule to change its rotation, and finally, to tie a knot in a polypeptide. They report that most of the volunteers, none of whom had ever used a VR system before, were able to use the system to some degree. Other less rigorous testing showed the system capable of doing things like allowing two people to toss a molecular buckyball back and forth across a real room. The researchers also report that the volunteers reported preferring the VR system over other applications, such as touchscreens. A user interactively guides a ligand to its binding site in the protein trypsin in virtual reality, adjusting visuals as befits the task. Credit: Helen Deeks, in collaboration with Interactive Scientific Ltd, under CC BY-ND 4.0. A user interactively guides a ligand to its binding site in the protein beta-lactamase in virtual reality. Credit: Helen Deeks, in collaboration with Interactive Scientific Ltd, under CC BY-ND 4.0. 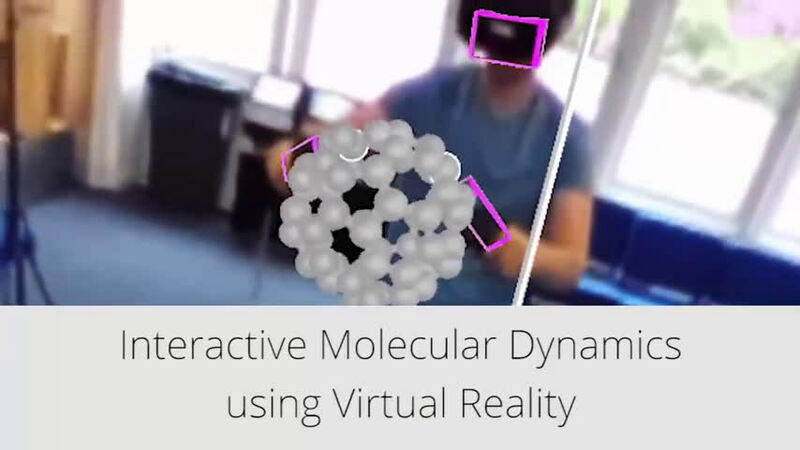 We describe a framework for interactive molecular dynamics in a multiuser virtual reality (VR) environment, combining rigorous cloud-mounted atomistic physics simulations with commodity VR hardware, which we have made accessible to readers (see isci.itch.io/nsb-imd). It allows users to visualize and sample, with atomic-level precision, the structures and dynamics of complex molecular structures "on the fly" and to interact with other users in the same virtual environment. 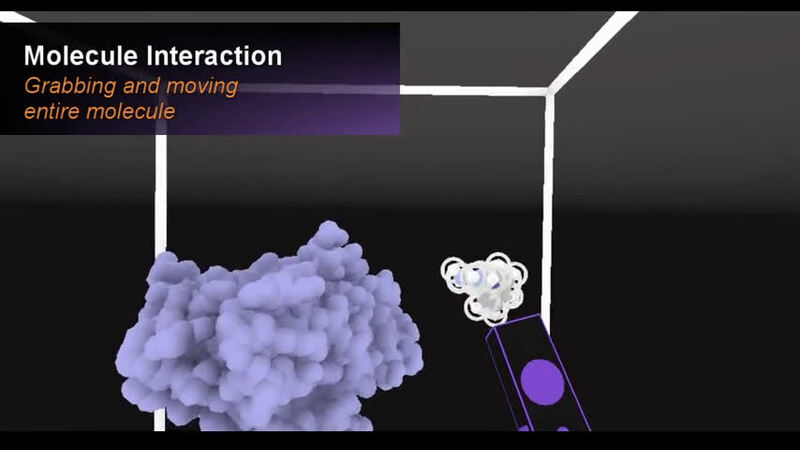 A series of controlled studies, in which participants were tasked with a range of molecular manipulation goals (threading methane through a nanotube, changing helical screw sense, and tying a protein knot), quantitatively demonstrate that users within the interactive VR environment can complete sophisticated molecular modeling tasks more quickly than they can using conventional interfaces, especially for molecular pathways and structural transitions whose conformational choreographies are intrinsically three-dimensional. This framework should accelerate progress in nanoscale molecular engineering areas including conformational mapping, drug development, synthetic biology, and catalyst design. 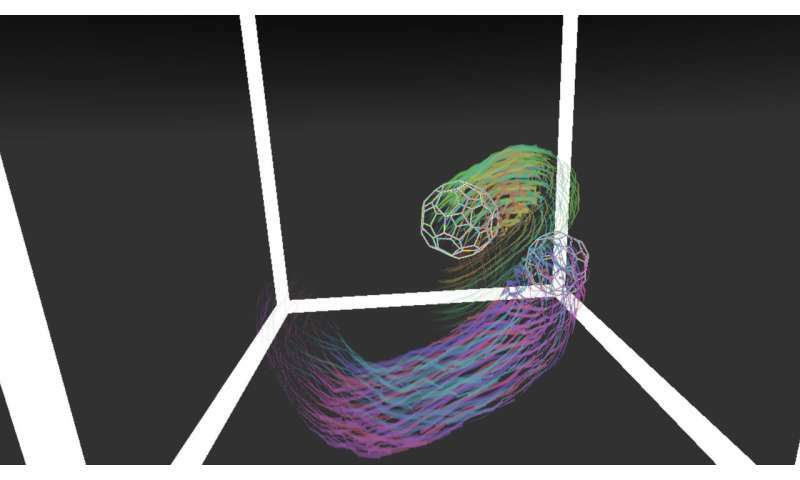 More broadly, our findings highlight the potential of VR in scientific domains where three-dimensional dynamics matter, spanning research and education. Anybody wishing to try out the tasks described in the paper can download the software at https://isci.itch.io/nsb-imd, and launch their own cloud-hosted session. where's your frequency analysis, zoom, response to plane wave, response to a single charge's motion, etc. each charge only see's a superimposed charge at +/- r of +/- q; therefore each center as an object; global object defines the space of interest, add some cool visuals, colors, ... it ain't dat hard!